YOU CAN MAKE BRIQUETTES BY HAND or WITH A PLASTIC MOLD! 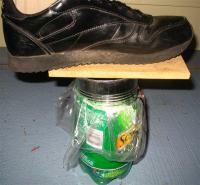 You can use a plastic bottle or other straight-sided plastic container about 4”-8” in diameter to shape the briquette. You will need a piece of wood or banana plant stem or a tin can that will fit into the container as a piston to press water out of the briquette mix, a knife, a plastic bag and some wire. The following is from Joyce Lockard's excellent instructions. First, prepare the briquette mix. Soak torn-up waste paper in water for one or two days to soften the paper and release the fibers, which will bind the briquette materials together. Rub the soaked paper between your hands until it looks like soft porridge and no pieces can be seen. This takes time! Do it well! Mix the paper with the sawdust and enough water so that the mix will hold together when it is squeezed. Cut off the upper quarter of a 2L soda bottle or other straight-sided plastic bottle. Make about a dozen drainage holes in the bottom and lower sides by burning holes with a hot wire. Prepare a thin plastic bag to use as a liner to get the finished briquette out of the bottle. Punch about a dozen drainage holes in the bottom and lower sides of the bag so water can drain out. Instead of a bottle, you can use a container with tapering sides such as a bucket or a plastic flower pot for the mold and a second one as the piston. The flower pot already has drainage slits around the bottom, and slits have been cut in the bottom edge of the bucket in the photo. Be sure to use a plastic liner with drainage holes. Put a big handful of briquette mix into the plastic bag and insert the bag into the bottle mold. Add more mix to the bag and press out water with a can or with a piece of wood or banana stem that fits into the mold. Put the mold on the ground or floor and stand on it to press out as much water as possible. Pull the bag out of the mold and remove the briquette. Dry the briquettes in the sun for 3-7 days. Briquettes that are not dry will smoke when they are burned, so dry them well! 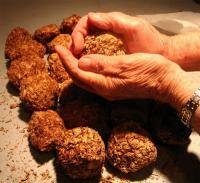 If you don’t have a mold, you can make fuel balls by squeezing the briquette mix into balls with your hands. Dry them in the sun. We have shown how an alternative fuel for cooking can be made by hand from waste paper and sawdust using a simple plastic mold for shaping the briquettes or by making fuel balls by hand. Please help spread this basic fuel briquette technology wherever finding wood for cooking is a problem. Help people cook, and reduce the cutting of trees for fuel!